Can Grid-Scale Storage Solve The Intermittency Problem? 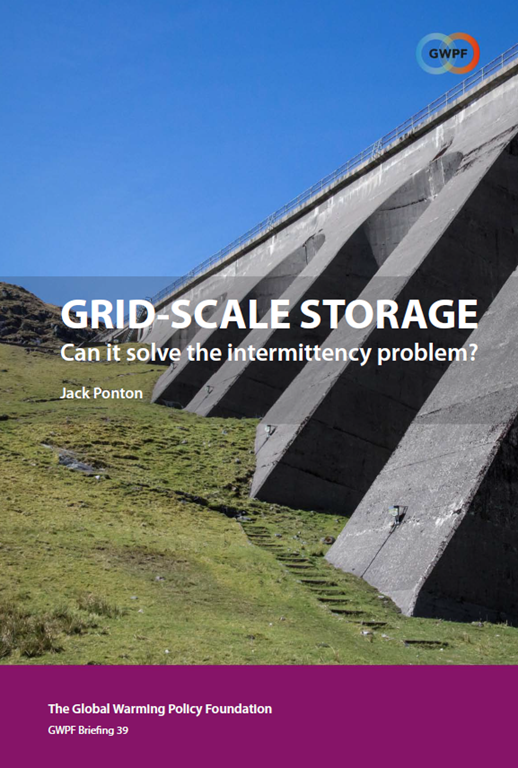 GWPF have published a new paper by Jack Ponton, Professor of Engineering at the University of Edinburgh, on whether storage systems can solve the intermittency problem of renewable energy. Indeed, seasonal variations are quite crippling, unless you are prepared to throw away large amounts of energy. Inter-year variations make matters even worse – you have to guard against at least a 1 in 50 bad year. Even allowing for round trip losses in a pumped hydro system of about 25%, 100% wind and solar would require something of the order of 35TWh of storage capacity in the UK just at current levels of demand (much more with electrification of transport and heating), assuming matched net supply and demand over a period of years. Of course, over-investing on a massive scale drives up costs enormously. Where we would put 4,000 Dinorwigs is a different question altogether. “How to ride through these very-long-timescale fluctuations? Electric vehicles and pumped storage are not going to help store the sort of quantities required”. He was quite clear that there was no solution that would work. As Paul has pointed out many times, one of the very best power storage facilities that can be called on at a moment’s notice is – a lump of coal. at a moment’s notice is – a lump of coal. At the moment it is needed, it needs to be pulverized. But we do understand. It takes a bit longer than a moment to get a coal-fired power station up to speed. And a lump of uranium is much more energy-dense than a lump of coal. Having worked on a steam turbine driven generator that was cooled down for us to work on, I can tell you that from cold – it was around freezing that night – it would take them 12 hours to bring it up to temperature to avoid thermal damage. Hence to reduce that time it requires heating and uses up energy doing nothing. And in the case of solar, not available at all for at least half the year. Can’t you be optimistic like many true believers? In GB, not available for nearly 9/10ths of the year. Annual average Capacity Factor is just ~11%, and only 2% during our month of greatest demand. The people clamoring for wind and solar power in the belief that it can replace fossil fuels and nuclear completely neither know what they are talking about nor understand the consequences of doing so. Unfortunately most/many people believe grid storage via batteries is viable today. Even pump storage is not reliable ….. ask New Zealand. Or hydro …. ask South America. The modern trend is for wind farms to come with a battery, no further effort is required by the Snake Oil Marketing Department, as the gullible will believe that the battery solves the intermittency problem for that wind farm, and the MSM will ask no awkward questions. BBC R5 is currently providing full broadcast facilities for the Snake Oil Marketing Department, and R4 Inside Science for its politburo. Step back and gawp in amazement at what has happened to science and journalism. The cumulative charge/discharge is the wavy purple line, with the greater quantity of charge than discharge over time reflecting round trip losses. It can readily be seen that the battery operations have little to nothing to do with the wind farm output: the main purpose is contributing towards stabilising the entire grid, which actually earned more revenue than price arbitrage operations (charge when prices are low, and discharge when they are high). It’s also easy to see that when wind output is low, the market is liable for price spikes (cyan line). They certainly do not belong in the Conservative Party. To any sound technical advice from engineers who can improve living standards at affordable cost, they have closed ears. sale of all new conventional petrol and diesel cars and vans by 2040. I’m not sure I would have been that polite. BWTM: you would need the additional generation to charge them up, too. You need generational capacity to meet current needs, PLUS capacity to meet future needs. Meanwhile the rapidly rising cost of ‘renewables’ and the 2008 Climate Change Act, will make UK manufacturing uncompetoitive post Brexit . As head of BEIS, what planet is Greg Clark living on ?? I agree that storage is too expensive to solve the interseasonal energy transfer problem, but the Grid-Scale Storage GWPF briefing is limited in considering alternatives. The report Minnesota Solar Potential Analysis is good for comparison. – Additional capacity coupled with energy curtailment is considerable less expensive than, and a viable alternative to, long-term or seasonal storage in a high renewables future (curtailment between 26% and 60% in the different alternatives of 70% solar and wind generation, without conventional generation; it reduces for values between 18% and 38% using 10% of conventional generation). – The use of traditional and flexible generation during brief periods of low-solar and low-wind production significantly reduces the generation costs for nearly half in the 70% solar and wind scenario. – Short-term storage is an important part of high renewables future, because it expands the dispatch capabilities of wind and solar assets (16 to 50GWh is needed for intra-hour variability in the 70% scenario, representing roughly one to five hours of Minnesota’s average hourly load); also, shifting of key flexible loads may further decrease generation costs (new EVs and domestic residential hot water loads, etc.). High levels of renewables are viable as long as you have plenty of conventional generation waiting on standbe, and as long as you are happy to have “energy curtailment” , ie power cuts. Meanwhile, as you admit, storage is pretty useless as a back up for intermittency, other than for a few hours, eg stoting solar during the day for use at night. There is nothing unexpected here. 1) What does the Minnesota study assume about availability of power from the rest of the US grid? 2) What happens to all of the excess power generated when there is too much wind/solar power? The Minnesota study did not include integration with MISO market. Therefore, the model did not consider opportunities to export / import leading to a conservative analysis (interconnections are a competitive tool with storage and less expensive). In the past, wind and solar have relied on subsidies. Recently, liking it or not, some wind and solar projects have appeared that do not need a subsidy or tax break to be viable. That has changed the energy game. Using a CCGT as the benchmark, there is a replacement benefit by VRE – Variable Renewable Energy if the VRE LCOE is lower than the CCGT’s LCOE. As the CCGT fixed cost is low, the key point starts when VRE LCOE is lower than the CCGT variable cost (and it is necessary to respect this criteria to define a level of acceptable curtailment). Of course, the backup and integration costs problem remain and it continues being a challenge to keep the system total cost affordable. The Minnesota study has the advantage of making clear that: “daily” cycle storage is important and economically justifiable; curtailment might be a better alternative than invest to much in storage; keeping a reasonable level of dispatchable generation has a strong impact in reducing total system costs (the backup alternative using “yearly” cycle storage is too expensive).